Cape Town - Team SA are all but certain to add to their gold medal tally at the London Paralympics on Tuesday evening. Natalie du Toit, swimming in the women's 400m freestyle S9 category, posted the quickest time in the heats, finishing an astonishing 13.41 seconds clear of her nearest rival, Britain's Stephanie Millward. Du Toit, who won gold in the women's 100m butterfly S9 last Thursday, posted 4:32.59 in winning Heat 2, with Millward touching the wall first in 4:46.00 in Heat 1. Du Toit's compatriot, Emily Gray, was the eighth and slowest qualifier for final, in a time of 5:00.44. 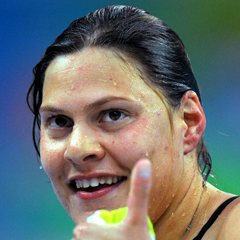 Du Toit owns the world record of 4:23.81 which she set in winning gold at the Beijing Paralympics in 2008. The final is scheduled for 19:10 SA time.